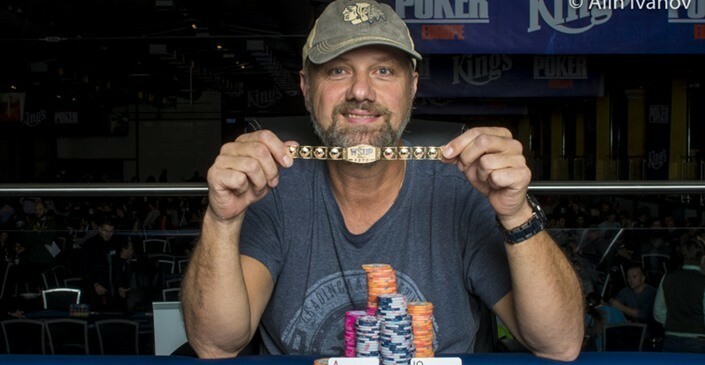 There are now just two more bracelets to be won at this year’s WSOPE at the Kings Casino Rozvadov after Event #8: €1,111 Little One for One Drop was won earlier this evening by Dutchman Albert Hoekendijk for €170,764. The event drew 868 players across two starting days, with 143 progressing to day 2, with 131 of those finishing in the money. Some big names who made the money, but who failed to make it through to the third and final day included; Allen Kessler (118th, for €1,660), Roland Israelashvili (112th, for €1,660), Mike Leah (98th, for €1,738), Marcel Luske (81st, for €2,016), Barny Boatman (77th, for €2,016), Will Kassouf (75th, for €2,016), and Maria Lampropulos (68th, for €2,231). Only 11 players made it through to day 3 with another Dutch player, Abdelhakim Zoufri, with a healthy chip lead of 4.26m, almost twice that of his nearest rival. At this stage Albert Hoekendijk was down in 7th place. However,Hoekendijk made his intentions clear from the start of day three, knocking out the first three players of the day inStanislav Koleno, Vlado Banicevic, and Przemyslaw Klejnowski, propelling himself to the top of the leaderboard.
. A board of blanks sent Lauck out to collect his €27,865 prize money.
. The sevens held (and in fact improved to a set on the turn) and Haisiuk was out in 5th for a €38,046 payday.
. A third ten on the flop ended Zoufri’s bracelet hopes as he fell in 4th for €52,703. sent Hoffman packing in 2nd for €105,532, while Albert Hoekendijk won the Netherlands 5th ever WSOP bracelet and enjoyed a €170,764 payday for coming out on top.